I’m missing something here, why are they tough on the fingers? A combination of the rough, not very pliable Axminster yarn and the main stitch (front-post trebles, UK terminology). In fact it is my right thumb that seems to suffer most because quite a bit of pressure is required to work the stitch. One pair every couple of weeks is as much as I could manage! Nice soles! I quite like darning and sewing on buttons. I find it therapeutic, bit like weeding, which I also like, especially grass roots! I have a pair of sheepskin slipper soles I’ve never used. I’d planned to make a pair of felt tops, but somehow it never happened and now the last thing I want is sheepskin slippers! Can I interest you in them for a future pair? You really don’t live in the right location for cosy slippers, do you! I’m sure that I could make use of your soles… thank you! You’re welcome! I’ve dug them out, but they may not get posted until we return from our road trip. They should be really very cosy, with the suede on the outside and the sheepskin on the inside, and a raised edge around the outside with holes punched for sewing/attaching the tops. I know, but unless I do it, I WILL forget. They’re sitting on my work table, and I’m going to write a note to put on them. Otherwise I’ll get back from the trip, wonder what they’re doing there and fling them back in the cupboard! I think your solution is both creative and ingenious! 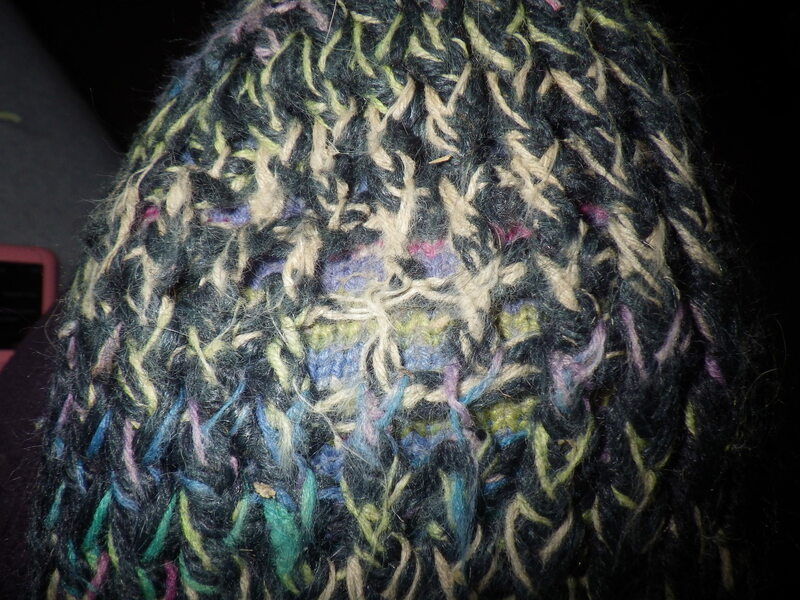 Darning would just have started a trend as other holes would have popped up to join the party. This way, sturdier, warmer, more colourful and longer lasting! The sheepskin soles will open a whole new realm of possibilities! Great repair job, have you thought about looking in second hand shops for leather jackets or skirts. I have some and intend to cut out soles for the next sock slippers that I make, not sure how well it will work but it’s worth a try I think. What nice slippers–and like walking on the sky, that color. 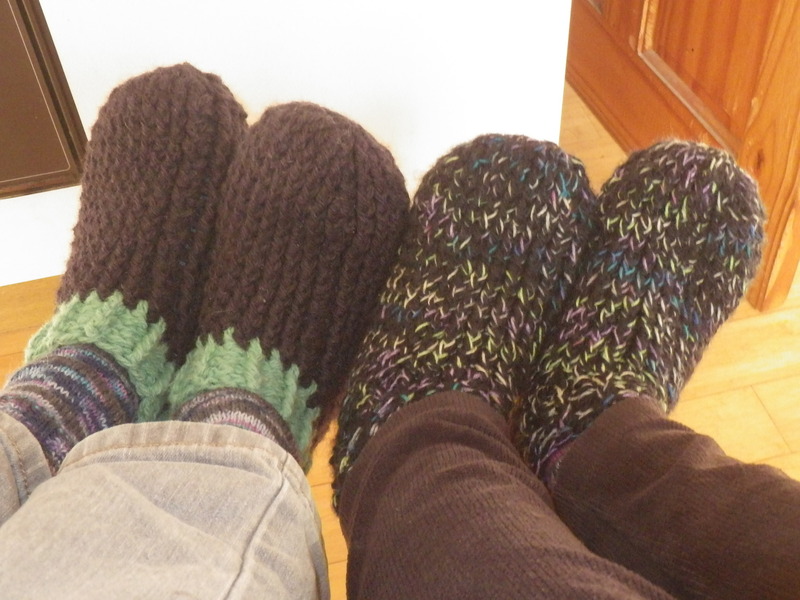 Maybe it’s just me, but lots of your colors seem to make me call to mind the atmosphere–like the aurora borealis sox!